We can’t ignore it any longer – Christmas is getting close! And now I realise I have bought about 10 presents for my baby granddaughter and nothing for anybody else so far. This year I plan to do “real” shopping and not do it all online, which felt like a pretty soulless business when I tried it last year. It’s always interesting to see what is on offer locally as well as feeling virtuous about not supporting the stranglehold that certain companies seem to have on internet shopping. 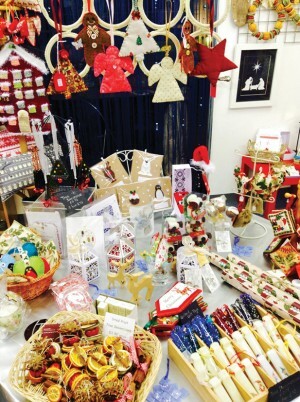 So how about this – a craft gallery in central Redditch, in Britten Street, packed with wonderful handcrafted objects made by local craftspeople, which would make great Christmas presents? I’m referring to Britten House Craft Gallery, somewhere I visited a couple of years ago, but which has recently undergone a transformation. It’s lighter, brighter, cosier and smarter than before but still retains the community focus that has always been the foundation of The Old Needle Works, where the Craft Gallery is situated. A chance meeting in 2012 between Brenda Killigrew, centre director of The Old Needle Works, and Marie Frascina, jewellery designer, led to the idea of creating a craft centre for Redditch. The two women wanted to create an area for local crafters to rent display space for their handcrafted products to be sold. Marie, as director of the project, mentors 30 crafters, helping them to price and market their beautiful gifts. More recently, Marie and her husband, Franco, completed an eight-week renovation project on this old needle factory and reopened to the public in April 2015 as Britten House Craft Gallery. The gallery is also home to Silveripple Jewellery, a beautiful range of contemporary jewellery designed and created by Marie. Attached to the gallery is a studio that facilitates small recreational workshops in jewellery making, glass fusing, art, pottery and crochet. When I visited, members of a lively art group were busy at work, while enjoying the support and companionship of each other and their tutor, Zora Payne. That’s what this place is all about – encouraging the creative side of individuals within our community and helping them to take that creativity to another level. Opening times: Tues–Fri 10.30am-5pm; Sat 10.30am-4pm; closed Sun and Mon. * The widely acclaimed Midland Youth Jazz Orchestra (MYJO), pictured below, is taking its Big Band Christmas Concert to Redditch for the first time. They have been described as one of the world’s top young big bands and were unbeaten in the BBC National Big Band Competition for 20 years. The band is led by top trumpeter John Ruddick, who has performed with the Don Lusher Big Band and BBC Big Band, and worked with such names as Sir Bruce Forsyth, the late George Shearing, and Peggie Lee. Last year John was awarded an MBE for his work with MYJO. Over the years, MYJO has included talented young players from Redditch, several of whom have made successful careers in the music industry. The concert, being promoted by the Rotary Club of Redditch, is at Trinity High School, Redditch on December 7 and will be a major fundraiser for local charity St Basil’s, committed to preventing youth homelessness in Redditch. Tickets cost £10 and can be obtained via http://www.1060.org.uk/redditch, by phone on 01675 442050, or from The Music Shop, George Walk, Kingfisher Shopping Centre (01527 68191). I hope you all have a very Happy Christmas!